Home > The World Ends With You > The catch-up coffee: The Nintendo Direct top 5 edition! The catch-up coffee: The Nintendo Direct top 5 edition! News by Lindsay M., Matt C. and Matt S.
Welcome to Digitally Downloaded’s regular catch-up news feature. With each issue we will bring you the best news that you may have missed — but this time we’re supersized and all about last week’s Nintendo Direct! It was a really good one, so we thought we’d pick out the highlights from the show. Grab the biggest mug you’ve got, fill it with your favourite brew, and catch up with us (and our favourite news anchor, Dee Dee)! Dark Souls is coming to Nintendo Switch! The biggest bit of news for the week was undoubtedly that Dark Souls, From Software’s famously compelling action JRPG, is coming to the Nintendo Switch, making it the first time the remorseless difficulty of a Souls game has been in an easily portable platform. Gothic melancholia, a massive open world to explore, filled with the most awe-inspiring beasts — all ready and willing to crush you in a moment’s flat, Dark Souls took everything that Demon’s Souls, its immediate (and sadly forgotten) predecessor such a memorable experience, and refined it to the point that From Software finally had a mainstream game on their hands. Dark Souls is the only one of the trilogy not available on modern consoles, so there are going to be a lot of fans that pick it up on that basis alone. Will they go with the Switch version, though? It’s difficult to imagine how anyone would not want to play that game on the go. I always assumed that Hyrule Warriors would eventually make its way to the Nintendo Switch. Not only is is a remarkably popular game from the Wii U and 3DS, but Koei Tecmo, the developer, likes to port its games from one platform to another; after Fire Emblem Warriors released last year, it seemed like now would be the right time for it. Hyrule Warriors: Definitive Edition has everything from the previous games — all the characters, all the DLC, the works. That means you’ll have a full 29 characters to play with - a massive roster that has built up through ongoing development into the game over the years. All that stuff together means a game that will last you hundreds of hours if you let it, too. On top of that, the Switch version lets you play multiplayer split screen on the go using the Switch’s Joycon controllers. I’ll have to admit that I’m not entirely sure how well that will work - split screen on that sized screen will make everything very tiny indeed… but if it works that will be another brilliant multiplayer experience for when you’re out and about. A lot of the announcements from the Nintendo Direct were at least somewhat expected, be that due to the rumour mill (Dark Souls Remastered) or just common sense (Hyrule Warriors: Definitive Edition). But one announcement that came way out of left field was SNK Heroines: Tag Team Frenzy, an all-women fighting game starring the lovely ladies of SNK's various franchises. Due out later this year on Switch and PlayStation 4, SNK Heroines seems to be aimed at a more casual audience, with one-button special moves and a variety of special items that can "change the tide of battle." It looks like simply emptying your opponent's health bar isn't enough; in order to win, you have to finish them off with a "Dream Finish" super move. You can also equip a range of different accessories and outfits to customise the look of your fighters. Five characters have been revealed so far: Athena Asamiya, Mai Shiranui, Leona Heidern, Kula Diamond, and Yuri Sakazaki. Judging from the silhouettes on the official website's splash page, there are at least seven more to be announced. Though SNK Heroines is being developed by SNK, NIS America is publishing it—which means there's an elaborate collector's edition available for preorder. The World Ends With You makes a return! As the most beloved Square Enix franchise that is completely ignored by its owner company, The World Ends With You: Final Remix on Nintendo Switch was an absolutely delightful announcement. Despite the overwhelming popularity of the original game from back on the Nintendo DS, the only thing we’ve seen or heard of the franchise since was a phone and tablet port a few years ago. Now, that original game is coming back to Nintendo Switch, and we can’t help but wonder if this is Square Enix’s way of gauging whether there’s still interest in the franchise. While the original game really required both screens on the DS’ hardware, the Switch obviously doesn’t have access to that kind of dual-screen setup so, like the mobile port, the experience has been condensed onto a single screen. You could say it loses something as a result of that, but really people play this one for its incredible style and verve, and that’s only going to get better on the Switch’s lovely big screen. Mario Tennis is back… with a story mode! 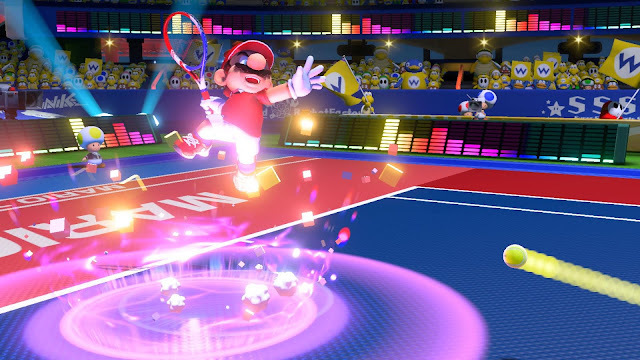 Mario Tennis stands out like a sore thumb amongst the rest of the announcements we’re covering today, with its bright colours and cartoon characters, but holy heck am I ever excited for it! It’s still early and we don’t have a ton of details, but here it is: Nintendo has announced the return of Mario Tennis! The last title in the series was Ultra Smash, released for the Wii U over two years ago. And since we all know how the Wii U fared… well, we sure know there are a lot of people sorely missing the series. Mario Tennis Aces is coming this spring (for us Northerners, so within the next three/five months or so) for the Switch! So what do we know? To start with, Mario Tennis Aces looks good. Sure, it will be fun to have as a portable title, but I believe the real place it belongs is on a television screen, with a room filled with screaming people trying to smash each other to obliteration (I may have had some intense Mario sports game sessions). The story mode is the first in a Mario Tennis title since the Game Boy Advance release of the series; Mario Golf titles have gained the mode in recent years as well. And what don’t we know? The biggest question going around seems to be how many players the multiplayer mode will support; keep in mind this is tennis, so I wouldn’t expect more than four unless Nintendo has gone out on a limb with a massive tournament-styled multiplayer mode. We don’t have any details on the story mode yet, but if we look at recent Mario sports titles with said mode we’ll likely find something similar to what’s coming up in Aces: entertaining missions, fun mini games, and familiar characters aplenty!